Steven Spielberg will be taking over the April's edition of Empire magazine to celebrate the release of Ready Player One. It's going to be packed with articles on the director and his movies. Earlier today we posted on our social media pages the cover for the magazine (above) and it is amazing. The artwork is by Paul Shipper who is fire at the moment having done the artwork for recently released Ready Player One poster. 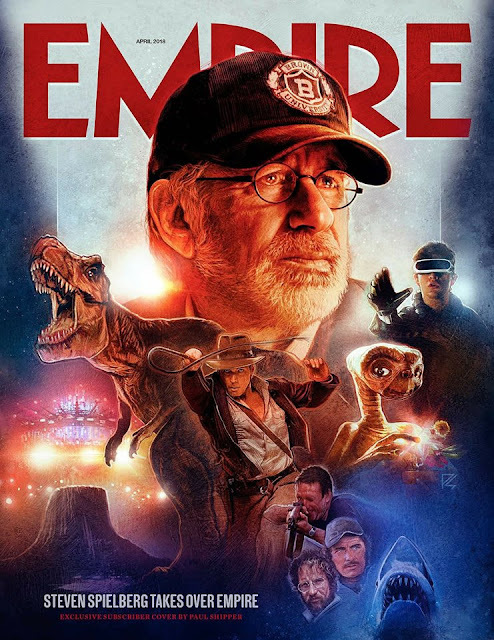 "The filmmaking icon sat down with Empire ahead of the launch of Ready Player One to deliver an issue celebrating his entire cinema-defining career — from Jaws and Jurassic Park, to E.T. and Saving Private Ryan — as well as his game-changing new virtual reality epic. Who better to introduce you to the Spielberg Takeover than the man himself — ladies and gentleman, Mr. Steven Spielberg." Stay tuned for more information about what’s inside the April issue — and prepare to grab your copy when it hits newsstands on Thursday 22 February. We're going to be giving away a copy of the special Spielberg edition. Stay tuned.